Looking for a Fitbit alternative that will help you watch your weight, follow your calorie intake, stay healthy and keep track of all those vital stats? Well, the choices we’ve chalked out for you include a couple of wearable accessories that can be slapped around the wrist as well as a whole slew of interesting applications that have the ability to clock in those important numbers while you concentrate on other activities such as jogging, running to catch the bus, having a quick bite at the local deli or even sleeping, dreaming about fitter days ahead. So get ready to shed those unwanted pounds and live a healthier lifestyle with the help of these names. ‘Know yourself, live better,’ is the call to arms here. 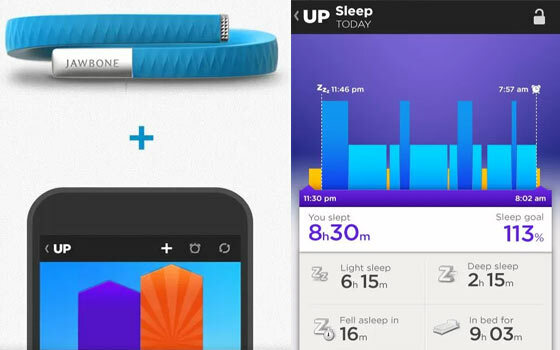 The product we’re talking about here is a wristband and app bundle that tracks your daily movements, sleep patterns and eating habits. According to the brains behind this endeavor, the handy accessory will help you wake up refreshed, eat healthy the fun way and keep track of how many paces you’ve covered in a day. While the snazzy-looking wristband keeps a tab on your daily activities and monitors sleep patterns, the mobile application displays the data it receives from the band. You can also add your own input like moods and meals. Whether it’s information based on your sleep, 24/7 activity, food and drink intake or even checking up on your friend’s progress, you can easily espy all these numbers at a glance via the application’s homescreen. The flexible and strong accessory is fashioned to cleverly match your everyday lifestyle. It even comes drenched in a number of colors such as red, mint green, blue, light gray, orange, hunter green, onyx and navy blue so that you can flaunt it proudly while staying healthy. Some of the other features it boasts of include insight engine, smart alarm, day and night form factor, water resistant design, power nap, idle alert, simple sync and 10-day battery. Available in a trio of sizes, this one will cost you just under $130. The Android and iOS applications can be procured from the respective app stores absolutely free of cost. Here’s another smart-looking accessory that helps keep you fit while sporting a trendy appearance. This entrant in our apps like Fitbit roster jumps in with the tagline, ‘life is a sport, make it count.’ The main aim behind a contraption like this is to track just how active you are while motivating you to move more, as per the developer. Packed with a sports-tested accelerometer, the attractive accessory tracks any sort of movement that includes activities such as dancing, walking, basketball and running. It clearly clocks in the number of calories burned and steps taken each day, and yes, it does tell time too. 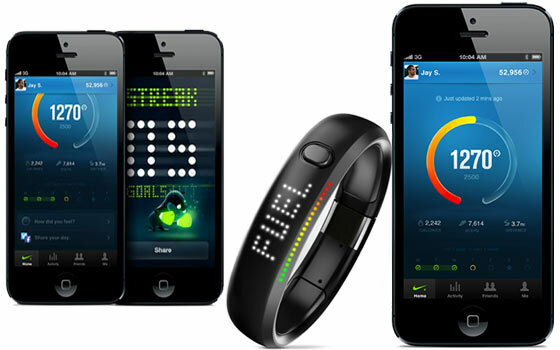 Here you can set a daily NikeFuel goal and monitor your progress via the band’s LED display. You’ll even be able to get an in-depth look at your daily stats by glancing at your iOS device through a dedicated app which is available for free on iTunes. What’s more, you can also help motivate friends and family members by sharing your achievements via Twitter, Facebook and Path. This interesting device comes splashed in a trio of colors namely, black, white ice and black ice, and can be picked up by shelling out just under $149. This inclusion in our programs similar to Fitbit array also hops onto the scenario with a virtual treat fashioned for iDevice owners. This one helps track your movement on a daily basis. However, unlike the aforesaid duo, you don’t have to invest in any external accessory for tracking your stats. All you need to do is infuse you iOS-compatible phone with this app and port it along with you wherever you go. 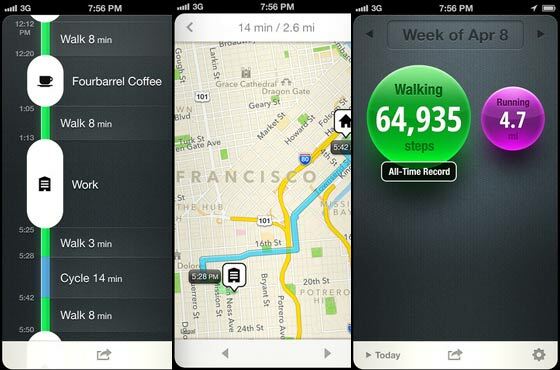 The program automatically records daily activities like cycling, walking, exercising and running. 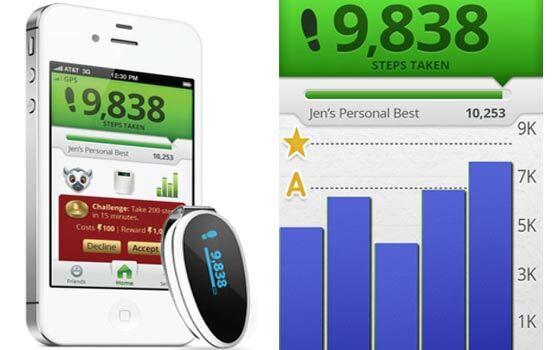 The software further provides an easy-to-read timeline for visualizing your day and pedometer for counting your steps. 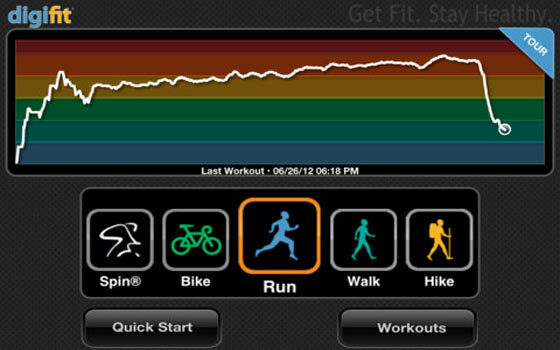 It even shows you the paths you took on a map and tracks the calories burned for a particular activity. And the icing on the cake here seems to be its $0 price tag. When you part ways with just under $70, you bargain for a sleek activity tracker that has the ability to pair with the Striiv iPhone app. This one aids you in tracking steps, stairs, calories, milestones and distance even when you are far away from your iDevice. The results are then displayed across the smartphone screen in the form of easy-to-read graphs. And in order to let you tag along the slim gadget with ease, it’s fitted with a durable nickel plated clip so you can simply hook it on any of your clothing items and forget about it. The application can be downloaded for $4.99. The final contender in our apps like Fitbit roundup doesn’t require any extra accessory or even the money in your wallet. The free app noted to be a cardio workout companion that records distance, time and speed of all your outdoor and indoor activities like running, biking, rowing, spinning or jogging. Some of the attributes you can expect to see here include customizable splits, online access to your workouts, voice feedback and in-workout pictures. 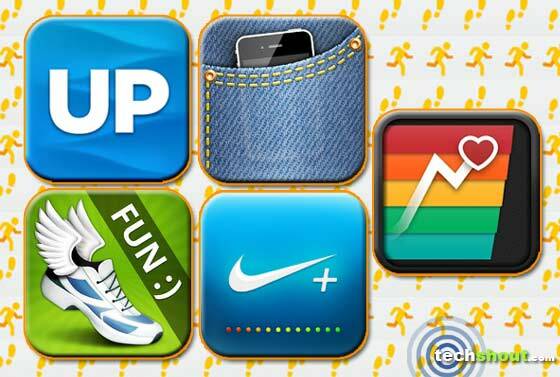 What’s more, the program also has the ability to sync with other applications like Twitter, Facebook, Runkeeper and more. And just in case you have supported accessories, you can even add training and heart rate monitoring to the mix. As the developer reveals, you’ll also be able to track your blood pressure, weight and sleep scores. This one is available for iOS and Android-infused devices. The fitness solution in the spotlight here provides a lineup of devices and applications that help clock in personal metrics like calories burned, number of steps taken in a day and the total distance you’ve covered, among other things. Flex, Zip, One and Aria are some of the company’s gadgets that aid you in the aforesaid endeavors. There are also corresponding mobile software bits that keep you informed about the numbers crunched even while you’re on the go. Now, if you want to shift your sights to a Fitbit alternative that proffers similar features, we suggest you take your pick from the lineup we’ve jotted down for you here. And when you zero in on one that perfectly suits your needs, don’t forget to tell us about your experience by penning down your comments in the box situated just below.